The Mummy franchise limps over the finishing line with a heave and a groan, much like the walking dead these films helped to popularise. The second sequel runs out of steam long before it even gets going. The engaging qualities of the original have all but vanished revealing only the film’s brazen lack of originality with bits lifted from Raiders of the Lost Arc, Tomb Raider, National Treasure and all the rest. Rachel Weisz has absconded leaving doe-eyed jock Fraser to try and wrestle up some chemistry with Maria Bello, but it’s a forced affair. John Hannah’s comedic Brit support attempts to add humour but eventually he’s left talking to a yak. Big, overblown CGI vistas and scores of beasts and brutes act to compensate for the lack of character, although the ancient China stuff is good and forms the film’s most interesting scenes (the tone of which is lifted almost directly from Hero). 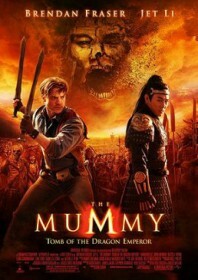 Jet Li turns evil for a wicked rendition of Chinese Emperor Qin who builds a nation on the crushed remains of slaves and adversaries, and he will stop at nothing to achieve immortality. He is turned into stone by a curse read out by Michelle Yeoh (in Sanskrit, for some reason) and buried with his terracotta army. Flash forward 2000 years and his tomb has been disturbed by Fraser’s hotheaded son during a post-war archaeological dig and brought to the attention of Anthony Wong’s crazed Red Army general, who resurrects the Emperor and unleashes all manner of horrors. Li appears mostly in computerised form from now on, firstly as a crumbling stone embodiment of his former self – which looks quite cool – and, later on, a fire breathing hydra, which doesn’t. The squabbling family of adventurers are joined by ninja lady Isabella Leong who provides constant exposition from Shanghai through to the Himalayas and finally settling in the fictitious paradise of Shangri-La. You will give up on the film the second three yetis appear to assist the central cast during a snowy gun battle with the Chinese military. This is the moment the film completely loses its mind. Michelle Yeoh appears again later to add a touch of gravitas but it is abundantly clear she shouldn’t be anywhere near this film. And how Rob Cohen could be allowed to get away with such a disappointingly short combat sequence between kung fu legends Li and Yeoh is borderline criminal. The huge CGI zombie battle which closes proceedings appears to have come at a great expense but, like most of the film, it is an empty spectacle.